The FIFA Club World Cup semifinals recently, saw Real Madrid in a highly deserved win over opponents, Club America in Yokohama, Japan. With this win, the Merengues will now go in head to head in the finals of the competition, with the Kashima Antlers, a game scheduled for next Sunday. The game which ended in a 2-0 win for Real Madrid, saw the opener being scored just near the half-time break by Karim Benzema. A late goal in the second half of the game by Cristiano Ronaldo, ensured that they finished the game as the undisputable winners. The semifinal game showed that the coach Zinedine Zidane was not taking any chances in this competition as he put forward some of his strongest men to feature in the game. Cristiano Ronaldo has stated that Jose Mourinho is one of the best managers he has ever played with. He said that the Portuguese manager is a great strategist and perfectionist and is always thinking how he can improve his team. Cristiano Ronaldo said that he has played under a lot of managers and that Jose Mourinho is the most perfectionists he has ever played for. He said that he is attentive to the smallest details and that he is always paying attention to the minor thing in the team. Ronaldo said that Jose Mourinho will spend most of his time analyzing his team tactics and that he will be looking for ways on how to improve the team. Portugal international Cristiano Ronaldo is missing from the list released to play the qualifiers for the coming World Cup billed for Russia in 2018. Portugal will need to get past Gibraltar and Switzerland to have a chance at the World Cup, and Ronaldo would be missing. He picked up the injury during the final of the Euro 2016 after he was roughly tackled. He had to be substituted, but remained active supporting his mates to the title win. The 31-year old was reported to only have just started training with Real Madrid last week, hence his missing name in the list of players for the World Cup qualifiers. Coach Fernando Santos dropped two other top names from his list as he deemed they were not active enough to get an invitation. He dropped Wolfsburg defender Vierinha and former Chelsea defender Ricardo Carvalho – who is unattached. Another difference to the Euro 2016 title winning squad is the addition of two players. Valencia defender Joao Cancelo and Porto striker Andre Silva have received their first invitation to the national team. Monaco attacker Bernardo Silva also returned to the set-up after missing Euro 2016. Italian giant Inter Milan are keen on landing Edison Cavani from French champions Paris Saint-Germain this summer. The club is reported by Daily Mail to have submitted a bid of £42 million for the PSG forward. The reports claim that the bid submission has been confirmed by the Italian press, no matter how unlikely the move is as the French club already released Zlatan Ibrahimovic. Corriere dello Sport say Inter Milan met with the management of PSG in the past week after they played their International Champions Cup game. Inter Milan are hoping to sell their star forward Mauro Icardi to Napoli who sold their star forward to Juventus for a record breaking fee. Inter believes that Napoli would be easily be able to afford their price tag for Icardi, which they will use to fund their deal with PSG for Edison Cavani. If you compare Cristiano Ronaldo with anyone it would probably be Lionel Messi. The latter has had achievements and shown abilities on the field that can be compared to Ronaldo and the latter to the former. With the recent announcement of Messi retiring from an international career, there is much debate and discussions doing the rounds about Messi and Ronaldo. Their images on and off the field are often compared to be polar opposites, akin to batman and joker. It is, however, irrefutable that both players are the best international players in the football arena. Zidane took over from Ex-Liverpool boss, Rafa Benitez, at the beginning of the year and has suffered only one defeat in that time. Zidane has guided Real Madrid to the summit of the La Liga after 36 matches and the Champions League semi-finals. The 31-year old forward expressed his satisfaction at working under the former Blancos player. “I admired him as a player and now as a coach. 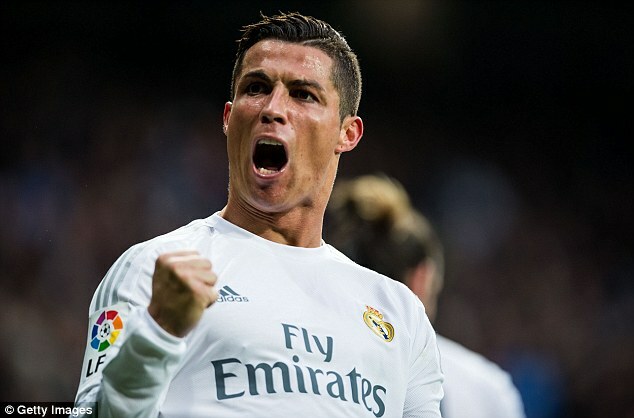 Cristiano Ronaldo is definitely delighted with the win at the home of bitter rival Barcelona. A picture of him in underwear together with his teammates was posted on Instagram by Gareth Bale. The photo shows an exciting Real Madrid team which was clearly pleased with the way they beat Barcelona and their potent attack. Indeed, Madrid has shown that they have now become the team that can expose Barcelona weakness and beat them whenever they want. This has been the case ever since Jose Mourinho was the manager and he was the first one to find effectively a way to stop the tiki-taka football. After the victory, Bale has declared that he still believes that they can still win the title but for this they will need to stay positive and stay united. They will need to replicate the kind of performance that they have demonstrated at the Nou Camp in the remaining matches of the season if they want to stand a chance of lifting the title. It has already been confirmed and announced to the public that David Beckham wants to lure ZlatanIbrahimovic to his MLS expansion team as the Englishman wants to bring world class players to his new club. Ibrahimovic himself stated that he would be delighted in making a move to the MLS side of David Beckham, so it’s only really a matter of time until the Swedish makes a transfer to the American League, this will probably occur when his time with PSG runs out. Another high profile player that David Beckham wants to lure to his American outfit is Real Madrid’s Cristiano Ronaldo. It’s believed that a 2 year long contract offer is what Beckham is prepared to offer the Portuguese superstar but contrary to Ibrahimovic who has already revealed his desire to actually join Beckham’s MLS team, Cristiano Ronaldo still hasn’t officially replied to the job offer of David Beckham.